Having power always near me is important. Not that I need it, my G3 battery lasts a pretty good amount of time. But whenever I have the opportunity to plug in, I plug in. I guess I'm just OCD like that. I never like going below 75% for some reason. Just like I never like going to stores when it's only 10 minutes to close (I used to have a fear of getting locked in the store when I was a child). One of the places I love to 'top up' is in the car. Not only is it the place where I'm not using the device (not even Ingress:) - but usually the chargers there have more 'oomph' than some wall chargers (and definitely WAY more than my computer USB). ZeroLemon has a sleek looking car charger for only $10 that has not one, not 2, but 3 USB ports for charging. One port is 2.1A (listed as for an iPad but I use it for my phone), another is 2.0A (listed as for Android) and then last is a 1.0A charger for iPhone. You can use any one you want, but I use the one next to the little blue LED which outputs 2.1A. The bigger the number, the faster the charge. Even the 1.0A is almost 2x as good as a computer USB port. 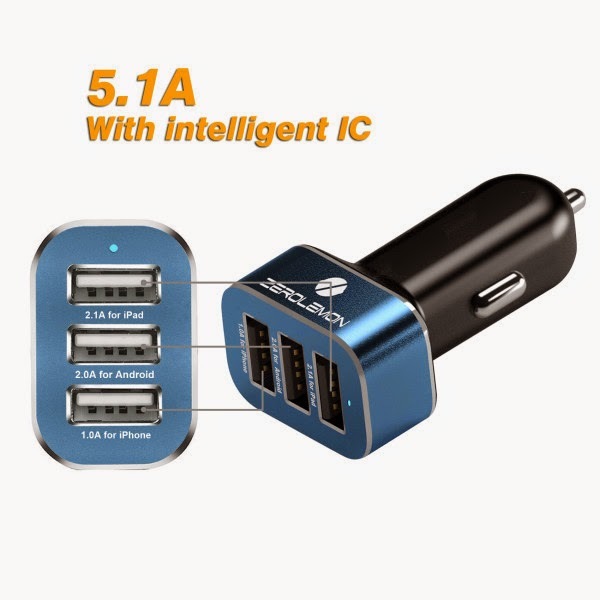 Best of all is that most of these car chargers tend to be either bulky if they have multiple ports, or if they're small, it's nearly impossible to remove it from the DC port. With this, it's got the best of both worlds, small enough to not interfere with anything around the port (I have my coffee holder near there and usually they're big enough to prevent me from using it) and with the lip it's very easy to pull out when needed. If you need a car charger, sure you can probably go buy one from any shop but either they're under $10 and SUPER CHEAP, or they're over $30. For $10 you can't go wrong.